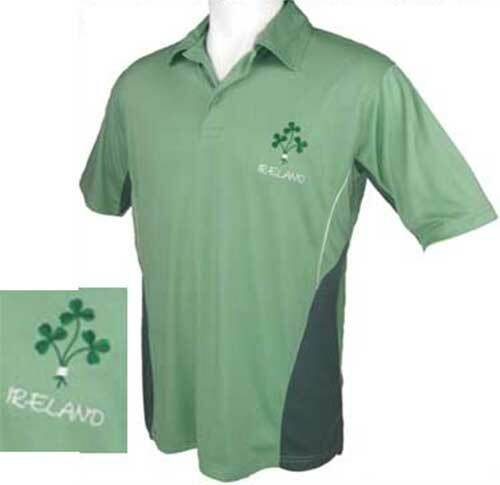 Irish polo shirt features an embroidered design that features the word Ireland along with a sprig of shamrocks. This Irish polo shirt features high-quality construction and stylish contrasting panels and offers the breathlite 2 layer system. The base layer keeps your skin dry by wicking moisture away while the outer layer keeps your skin cool in hot weather. This spring green Irish polo shirt features steel grey accenting and embroidered Kelly green shamrocks along with the word Ireland embroidered in white on the left chest. The 100% polyester Irish polo shirt is enhanced with high-performance breathable fabric and would be perfect on the golf course or for casual wear. The Irish golf shirt is available in adult sizes small through 3XL (sorry, no size XL) and it is received with a shamrock history card, complements of The Irish Gift House. Irish polo shirt features an embroidered harp and shamrock motif on the left chest. Irish polo shirt features an embroidered design that features Ireland along with a sprig of shamrocks. Irish coat of arms polo shirt features your Irish family shield imprinted on the left chest. Irish polo shirt features an embroidered appliqué design that features a shamrock crest.